The concept of Healthy light arises from recent discoveries of the non-visual effects of certain wavelengths of light, its activating effects on the human nervous system and the synchronization of the body’s biological clock. The level of hormones, ratio of blood cells, body temperature, mood and alertness are affected by exposure to light. The blue component of light is the control signal for these processes. It is therefore desirable that artificial light designed for the active part of the day has as much of this blue component as daylight, thus Ac → 100 . Higher Ac means higher chromatic temperature: Tcp → 6 500 K. This tone of light – along with the ‘general’ Ra ≈ 80 is often seen as uncomfortable. However, this tone along with excellent colour rendering Ra > 90 and mainly with good deep-red rendering R9 > 80 is reported by respondents as being pleasant, light and evoking a feeling of natural sunlight rather than artificial light. Based on these subjective evaluations, a new technical definition of full spectrum artificial light is being built. The full spectrum light sources usually have a lower luminous efficacy (lm/W) compared to normal (Ra > 80) lamps. 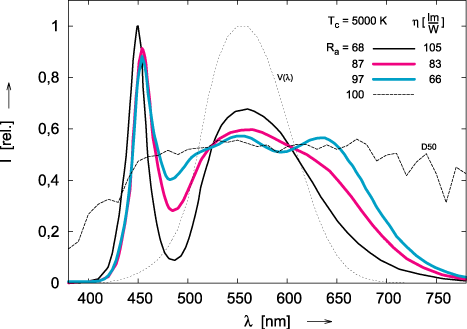 This drop is not only caused by the lower efficiency of the broadband phosphors. 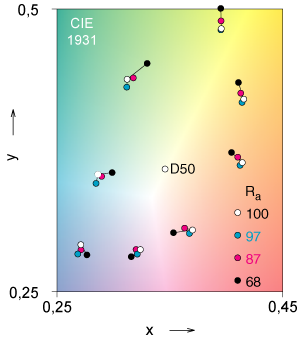 To achieve high Ra, wavelengths near the boundaries of the visible band need to radiate as well (violet and deep red colours), that – according to V(λ) – contribute to the luminous flux with a little weight, see fig. 1. Sources of light bring additional benefits along with light itself – they activate the nervous system and affect the circadian rhythm. The degree of this benefit, however, does not affect their energetic profile in any way. Light for relaxing and calming down before sleep should contain as little of the activating component as possible. For example, Ac of a warm incandescent bulb is about 30. Along with dim illumination it does not prevent melatonin to rise in evening hours. We should not be disturbed by light at night as melatonin, the sleep hormone, has many regenerative and protective functions. Healthy light sources are also used in depression treatment with light (phototherapy). In certain cases, the light effects are comparable to those of antidepressant drugs . 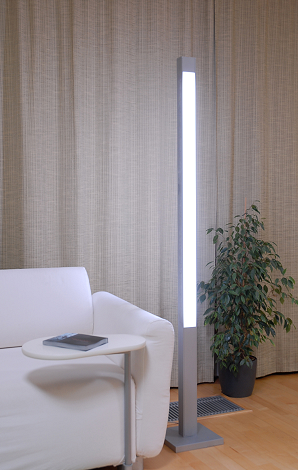 Light is fortunately available without prescription, so we can help ourselves best by walking in the sunshine, or at least by looking into bright comfortable electric lighting. The NASLI R&D laboratory offers spectral measurements of light sources and spectral transmission of plastics using a grid monochromator spectrometer, testing luminaire safety before accredited tests, detection and EMI reduction using a spectrum analyzer. NASLI develops HLS®, the concept of holistic lighting. The goal is to specify neglected aspects of light sources and luminaires and the methods to achieve their improvements. HLS consists of Extended Electrical Safety (LVD+), Enhanced Electromagnetic compatibility (EMC+), Light and its quality (QLI+) and Non-visual effects of light (NVE+). In the start-up Full spectrum lighting studio, lighting for apartments, offices and production floors is designed according to the concept of Healthy light using NASLI light sources and luminaires. As well as the new systems, modifications and upgrades of existing systems for use with light sources of high Ac and Ra are designed. The studio also performs light measurements. Czech Railways, České dráhy, a. s.
 FUKSA, A.: Light and the biological clock. Světlo (Light), 2010, no. 6, p. 56–58. Available from: http://www.nasli.net/pdf/light_and_the_biological_clock_2010.pdf. LAM, R. W. a kol. : The CanSAD Study. Am J Psychiatry, 2006, no. 163, p. 805–812. This article has been adapted from the journal Světlo, www.svetlo.info, No. 5/2013, p. 24.